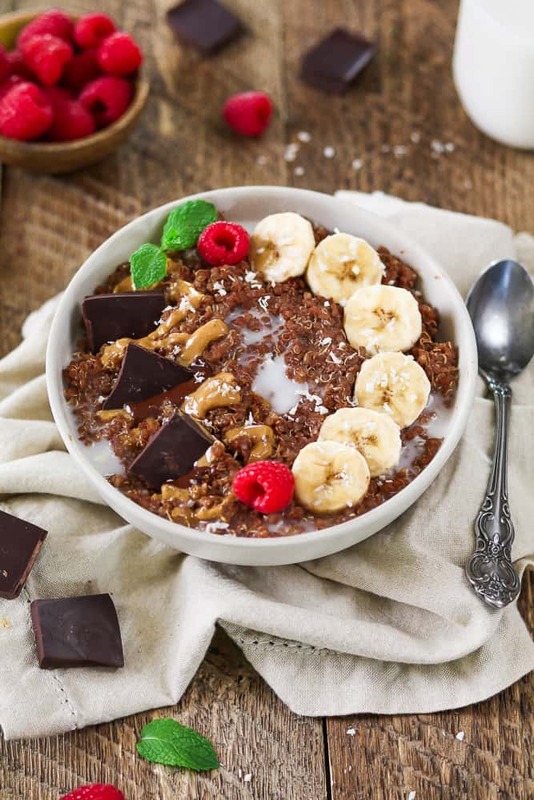 Liven up your morning with this Chunky Monkey Breakfast Quinoa Bowl. The combination of creamy peanut butter, sweet bananas, & rich dark chocolate will send your taste buds into overdrive. Oh, yeah, it’s super nutritious, too! Say goodbye to your sad morning oats because quinoa is the new grain in town! 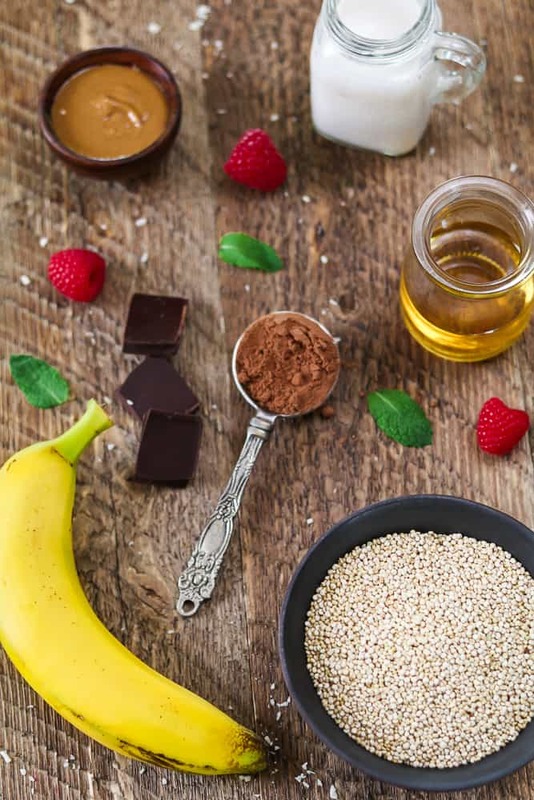 (pssst…it’s actually a seed) This Breakfast Quinoa Bowl is protein and nutrient-rich to keep you going all day long. This may seem a like a stereotypical vegan hippie recipe, but I promise, it’s so much more. 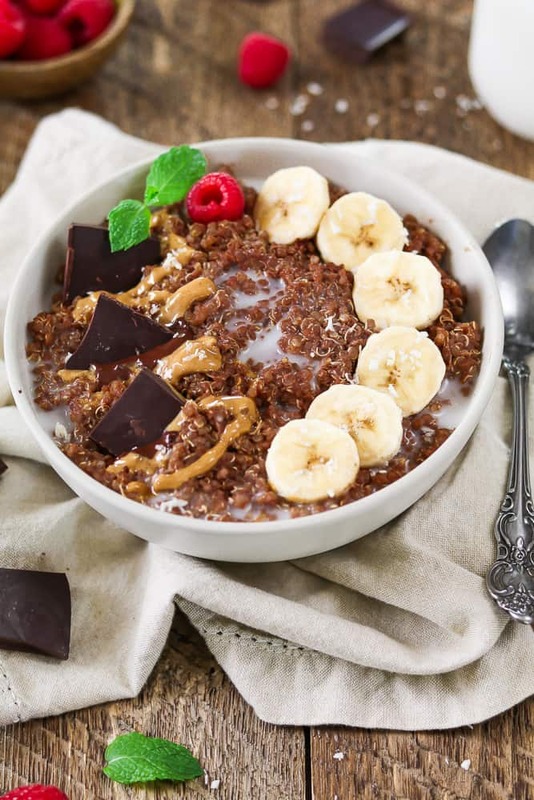 Yeah, sure, it’s quinoa, but it’s smothered in chocolate, peanut butter, non-dairy milk, and bananas. It’s scrumptious! Now, if you totally hate quinoa, you may want to skip this one and make my Vegan Breakfast Quesadillas instead. They are just as hearty and nutritious. If you need more breakfast inspiration, you can check out my all-time favorite list of 30 Vegan Breakfast Recipes. You’ll be sure to find something there. Eating vegan food doesn’t have to be boring. For toppings, you can go simple or get crazy. 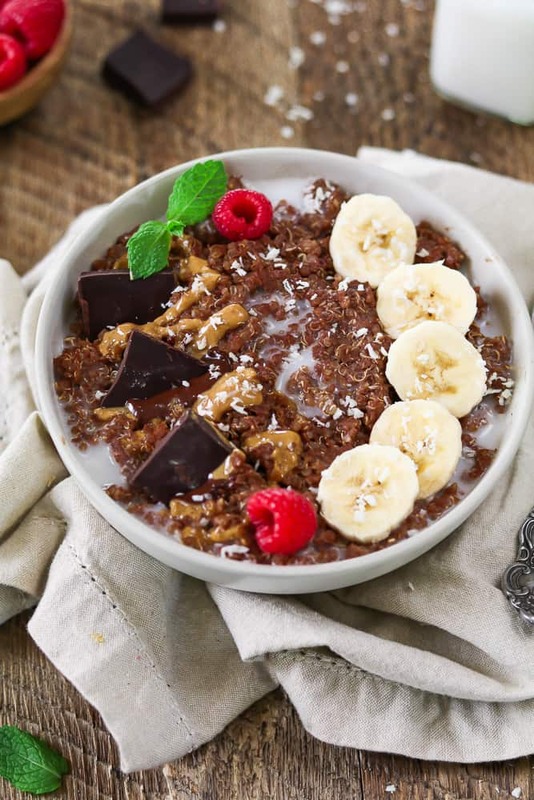 You can add a peanut butter swirl, banana coins, chunks of dark chocolate, coconut flakes, berries, nuts, seeds, granola, non-dairy milk, vegan butter or jam. Have fun with it! Don’t forget to rinse the quinoa! Rinsing quinoa thoroughly before cooking is an important step. So, unless you buy a Pre-Washed Variety, I would rinse the quinoa in a Fine Mesh Strainer for a good 2 minutes, until the water runs clear. This will remove most of the quinoa’s natural coating, called saponin. This coating is naturally designed by the plant to ward off insects and other predators. How cool is that? It’s not toxic to humans, but some studies claim that it can cause digestive issues, so it’s better just to rinse and be safe. Also, the saponin coating gives the quinoa a bitter taste, so you’ll be removing that issue as well. Now, you’ll be left with fluffy quinoa that has a subtle nutty and earthy flavor. So worth the extra few minutes! What’s so healthy about quinoa? So, it’s good for your brain, blood, muscles, skin and your overall well-being. Yay for quinoa! It’s so easy to make and it’ll be on your table fast! Just add quinoa and a pinch of salt to a medium pot. Cover and bring to a low-boil for 15-20 minutes. You want to cook the quinoa until it’s fluffy and the liquid is absorbed. Now, uncover and turn heat to low and stir in the non-dairy milk, mashed banana, cocoa powder, and maple syrup. Warm for 1-2 minutes. Taste and adjust flavor if needed. Add your favorite toppings and additional milk if desired. Serve immediately. 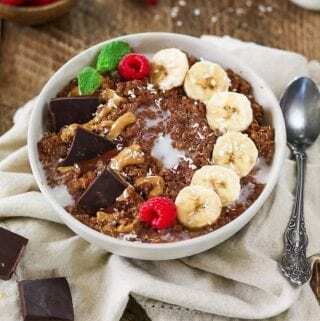 If you make this Breakfast Quinoa Bowl, let me know what you think by ★ star rating it and leaving a comment below. It would really make my day. You can also follow me on Instagram and share your creation with me. Just tag me @veganhuggs and hashtag #veganhuggs so I don’t miss it. 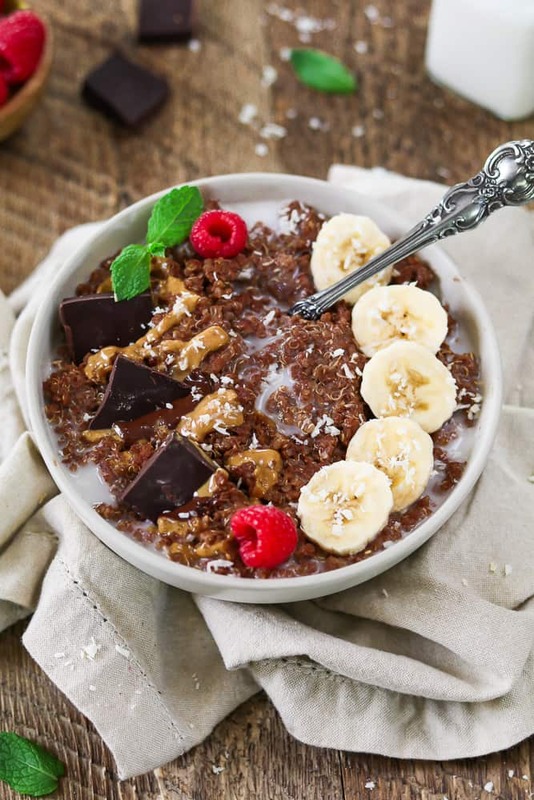 Liven up your morning with this Chunky Monkey Breakfast Quinoa Bowl. The combination of creamy peanut butter, sweet bananas, & rich dark chocolate will send your taste buds into overdrive. Oh, yeah, it's super nutritious, too! In a medium pot, add the quinoa and salt to 2 cups of low-boiling water. Put lid on top. Cook until liquid is gone and quinoa is fluffy. This usually takes about 15-20 minutes to cook. Uncover and turn heat to low. Stir in non-dairy milk, peanut butter, mashed banana, cocoa powder, and maple syrup. Warm for 1-2 minutes. Taste and adjust flavor if needed. Add favorite toppings and additional milk if desired. Serve immediately. Enjoy! 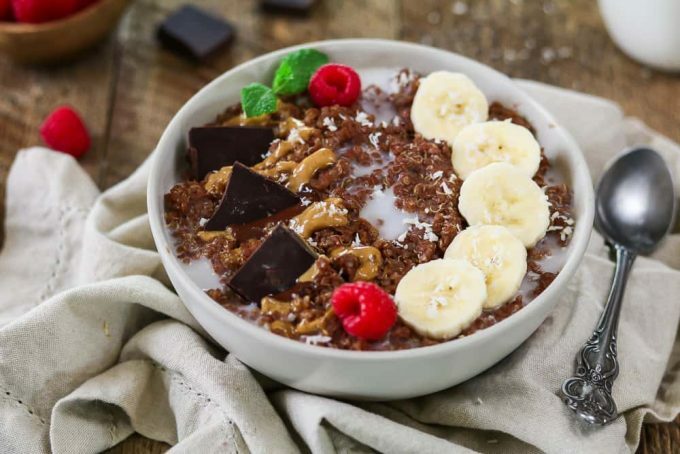 * Topping Ideas: peanut butter, banana coins, dark chocolate chunks, coconut flakes, berries, nuts, seeds, granola or jam. I love these bowls and make them at least 2 times a week in our breakfast rotation!.